We will pick you up from your Sharm hotel and transfer to Airport to fly to Cairo. Arrive in Cairo airport then drive with private van with personal Egyptologist guide to uncover the Pyramids of Cheops, Chephren and Mykerinus, continue to the Sphinx with pharaoh head and lion body and the Valley Temple attached to Chephren Pyramid. Get your lunch in local restaurant then move to the Egyptian Museum that displays artifacts from all Pharaonic periods covering about 5000 years of history, it is believed to be the biggest valuable collection of Egyptian art. Then stroll the streets of Khan El Khalili Bazaar, the oldest local market in Egypt and Middle East. 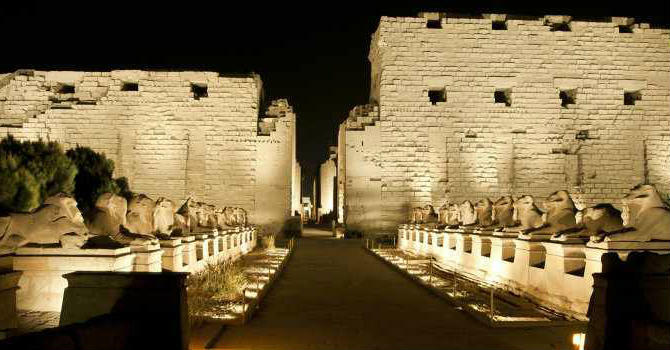 Evening transfer to Cairo airport to get the flight to Luxor, arrive there then transfer to Luxor hotel and overnight. We will pick you up shortly after breakfast then join your proficient guide to explore the majestic temple of Karnak, it is known as biggest worship place in ancient world. get your lunch meal in local restaurant then cross the River Nile to the West Bank of Luxor. Stop at the two quartz colossal statues of Amenhotep III known also as Memnon Colossi. Continue to wander the Valley of Kings, where the impressive tombs of the New Kingdom buried kings, only 3 tombs are included except the one of Tutankamon at extra charge. Visit El Deir El Bahary temple of queen Hatshepsut, this imposing temple is built and devoted to the powerful Queen Hatshepsut, the only female ruler of ancient Egypt. Evening transfer to Luxor airport, fly to Sharm El Sheikh then transfer back to your hotel.